Astrology has a lot to say about Trump’s future and the events about to unfold. 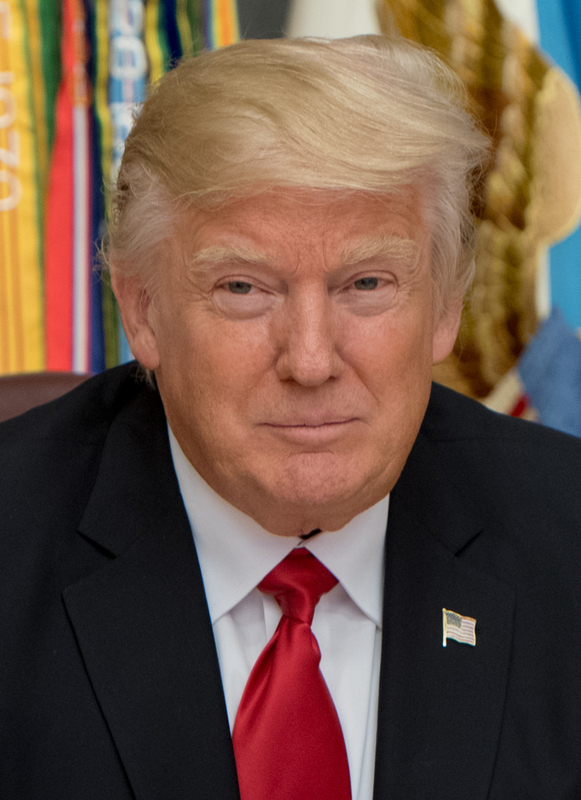 It has been an amazing time in US history with the election of Trump into the White House by the Electoral College when his opponent won the popular vote by three million more votes. The main turning point for this event occurred astrologically in August 2016 when a losing Trump campaign got the Republican nomination and the Mercers’ backed his election with Mercer money and staff (Steve Bannon and company). The Mercers required that Trump use their political operatives if they were going to fund him. 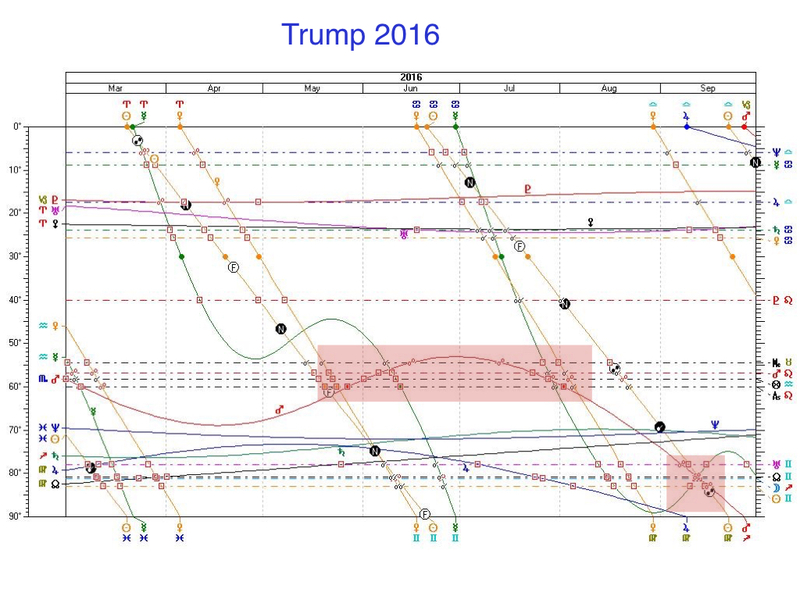 This was during a period of Mars transiting Out of Bounds (OOB) that brought extraordinary business money to Trump. In the same month a Saturn square Neptune formed in the sky that indicated fake news, false reports and hidden factors like Russian interference dominating this election period through November. Add in a solar eclipse in late August also tipping the balance into early September with unexpected events and surprises like the unprecedented FBI Comey’s testimony to Congress that Hilary Clinton had more email problems (which turned out to be false information from the Russians) just as early voting had started. The power of this Saturn squares Neptune to create a false reality, instilling FUD (fear, uncertainty and doubt), and promoting a false persona for president. The reality of the real Trump, the consequences of the Russian interference, and the obstruction of justice has only just started. The transits of 2017 will be the deciding factor of whether Trump will survive his presidency or leave office. The stage has been set when the lunar nodes moved into Leo/Aquarius tropically in late April 2017. All has turned sour for Trump with the lunar nodes of fate and consequences have been passing through his Leo ascendant. 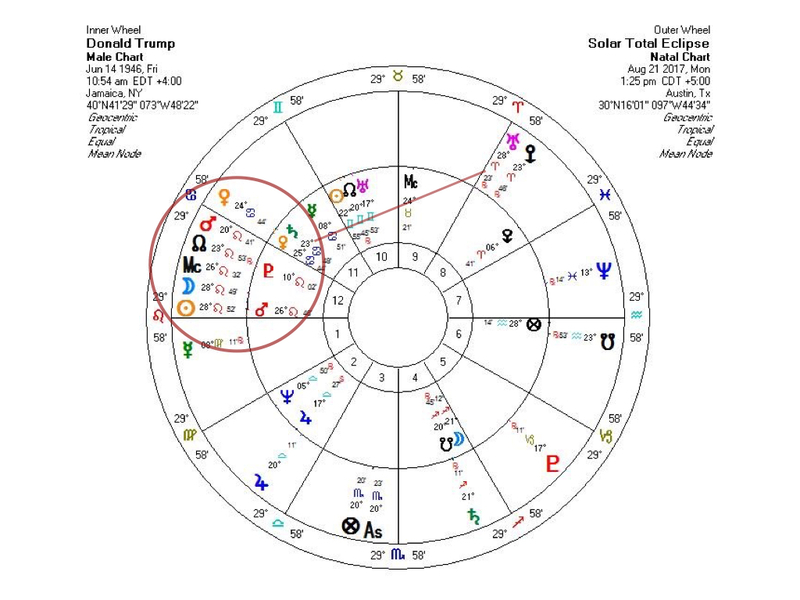 Let’s look at his natal chart and look at some hidden factors that are important to his character and the times ahead for him. 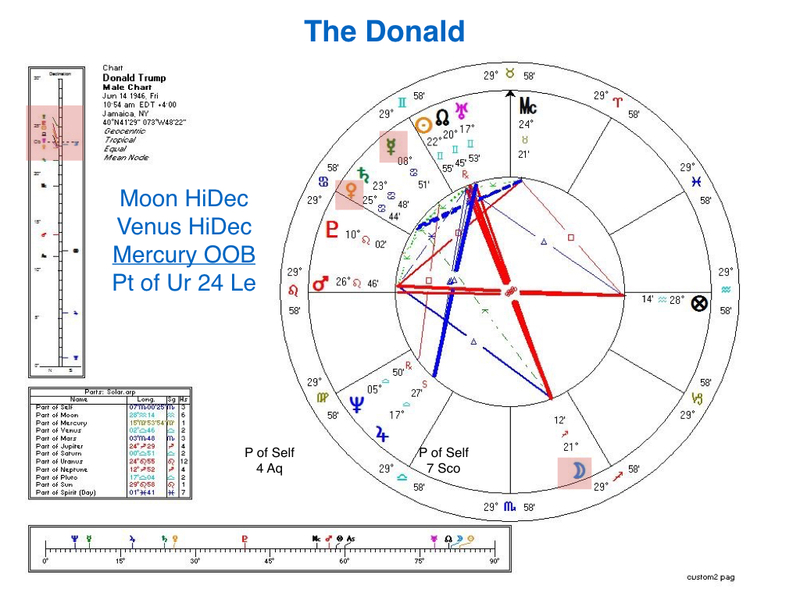 There are many other astrologers that have analyzed Trump’s chart but here are some additional factors that magnify his character. Trump’s inability to contain his tweets to the public is clearly seen with his Gemini Sun being ruled by Mercury when that planet is OOB. He simply cannot contain or restrain himself. Added to this factor is that his Sun is conjunct the North Lunar Node and Uranus in Gemini. His level of implusivity is high and highly reactive. Gemini mental energy is intense and many thoughts competiting at once which is likely to explain how difficult it is for him to complete a sentence or thought. His mind just races ahead. He is noted for his protective and strong need to fight back the slightest threat by a stronger attack back or by lawsuit. Yes, it is seen by Mars on the Ascendant but there is another hidden factor that magifies this characteristic with the Part of Uranus at 24 Leo. This creates a Uranus conjunct Mars aspect near his Ascendant. This increases his reactivity by striking back without forthought. It reminds me of the primative motion of the jaws of an alligator. Throw some food into an alligator’s mouth and it snaps shut with automatic nerve reaction, no mental thought required. This hidden factor will be important in the coming months as the transits hit these points. Below is the critical events timeline that has happened to date as this article was written July 4, 2017. I will add onto the event list at the end of the article as it occurs since this is a prediction for the coming period before the nation and Trump. Trump’s tweets and actions have been basically a distraction from the serious events that have started in December 2016 by the FBI and other intelligence agencies and then with Congress investigations in April 2017. These stable, long term agencies are run independently of the President. To some degree the President can direct their activities but these security and legal agencies were designed to be autonomous from the Presidency. Some call them the Deep State (a new term) but they are the nuts and bolts of our federal government that keep on functioning outside of politics. They can be represented by Saturn as it represents long term standards, practicies and permanent agencies. It can be represented by Mars when legal authority has dominance over a person’s activities. Mars can be parental authority, school authority, one’s boss or supervisor, the police or a judge. Then there is Pluto that can represent military action, the mafia or gang actions; or even the FBI, CIA or Russian KGB. These are the hidden, deep organizations that take organized actions of authority undercover, out of sight. Lastly there are the Lunar Nodes that can bring unexpected events or climaxes of trends into focus with an increase of intensity when Eclipses or Moon Wobbles form during long term trends. All of these factors are operational the remainer of the year for Trump. It is a crisis period that has started and will continue to unfold with multiple events to come. 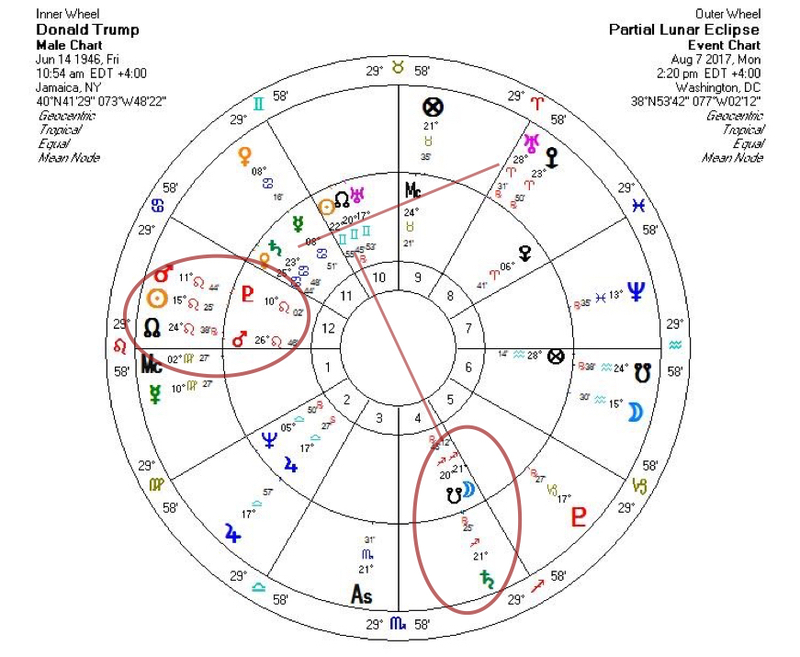 Note that when the Lunar Nodes moved into tropical Leo/Aquarius and onto Trump’s Ascendant, major events started to occur. They were in the works before this time but the announcements and actions started to manifest when the nodes moved. Most astrologers ignore the Moon Wobbles simply because they have not been taught about them. 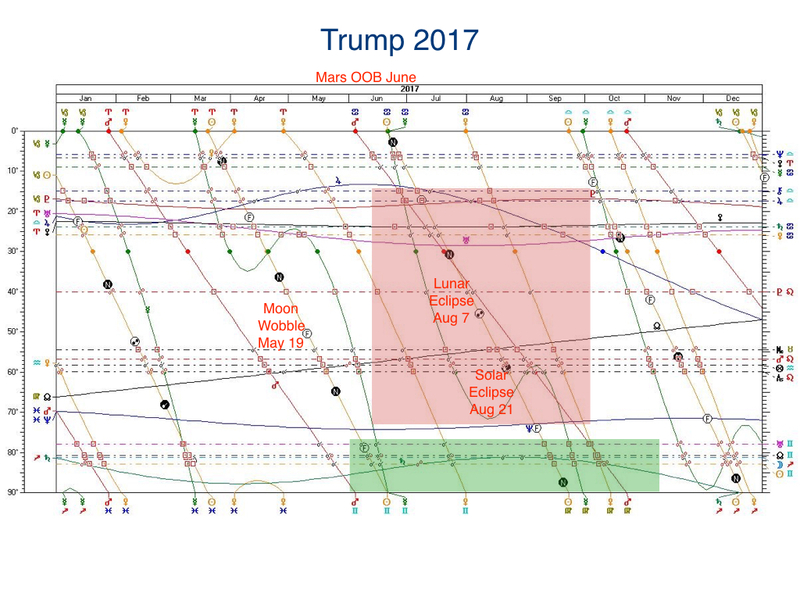 This last Moon Wobble on May 19th was important to Trump’s chart since the lunar nodes were exact on his Ascendant. Just look up at the event list above. The authorative/legal action by government agencies were announced during this time period. 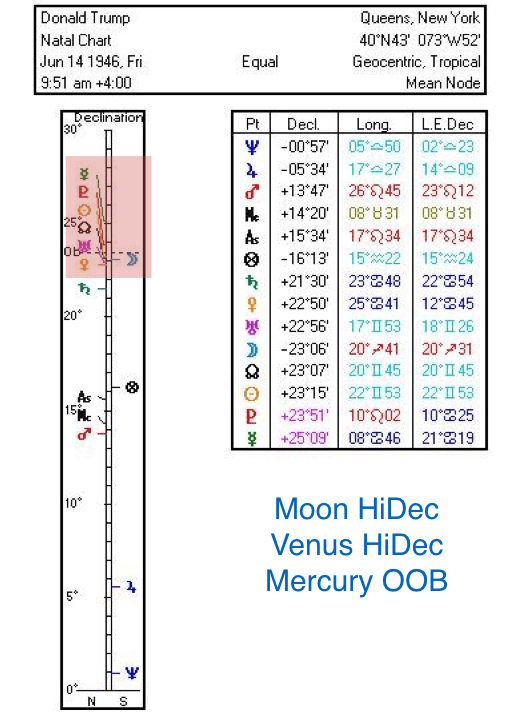 Note how these Lunar Nodes will be in hard aspect to his natal planets of Ascendant, Part of Fortune, Mars and Midheaven until October 2017 (shaded in red). 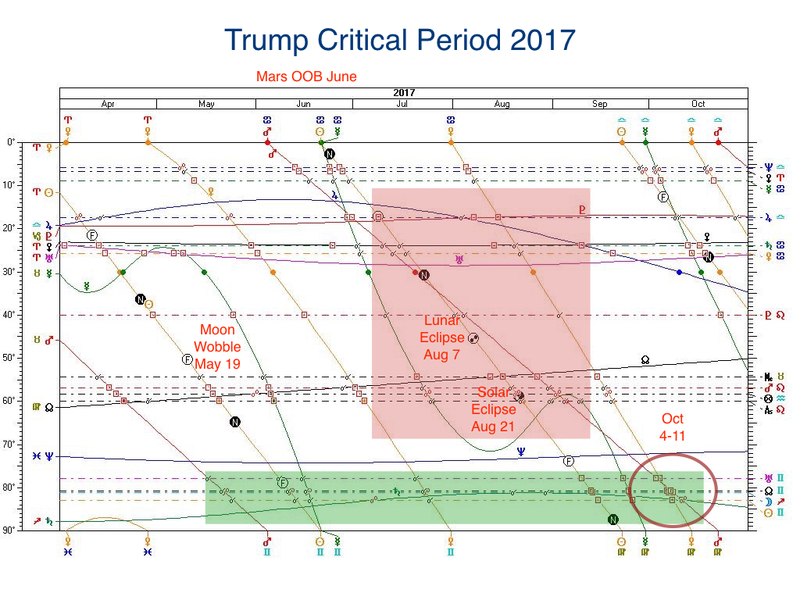 Note also that Trump will have his final third pass of Saturn on his Moon until November (green shading). The last pass he was required by his attorneys to settle many lawsuits he had open. It cost him tens of millions of dollars to close these lawsuits (Saturn the planet of restriction on his Moon, planet of women and money). It was during this last pass that his wife did not move into the White House so he had to live there alone (loss of female comfort and affection). So this coming last pass can represent more monetary loss or it could also mean more health problems since the natal Moon can represent one’s physical body. His Moon is opposed by his Sun, north node and Uranus. Saturn stationary there can mean more feeling of restriction, depression and being confined. It is a hot and cold aspect when one alternates between too many restrictions and then lashes out with rebellion to the limits and restrictions. Feelings of being dragged down and self pity are strong under the weigh of limitations. It doesn’t stop there, another climax is with the Solar Eclipse on August 21st. Events that have been brewing in the background come forward into public view. What has been suppressed will surface into the news. These lunar nodes are in Leo/Aquarius on Trump’s Mars. He could have serious health issues come up with all this pressure and restriction. It could most likely affect his heart (Leo rules the heart). Could there be an attempt on his life? Eclipses produce shocking events that surprise and come out of nowhere. The investigations by authority agencies (Mars) will come into light in August but I don’t think that these actions/events will resolve themselves immediately. Much discussion will be done behind closed doors with attorneys and Republican leadership to decide on a course of action. Look for the period of October 4-11th when decisions could be made public. Will he resign? I’m sure he is not having any fun this year and he is very protective of his Russian connections with his real estate business. Russia lent him lots of money after his bankruptcies when the NY banks had to walk away with massive loan losses. It could just be easier to leave office than to be subjected to more harassment by governmental authorities that will not give him loyalty or protection. He sowed these seeds last December when he criticized and tried to deface the FBI, CIA, Home Land Authority, etc. These agencies have tracked him and hunted down all the facts to build a case against him. 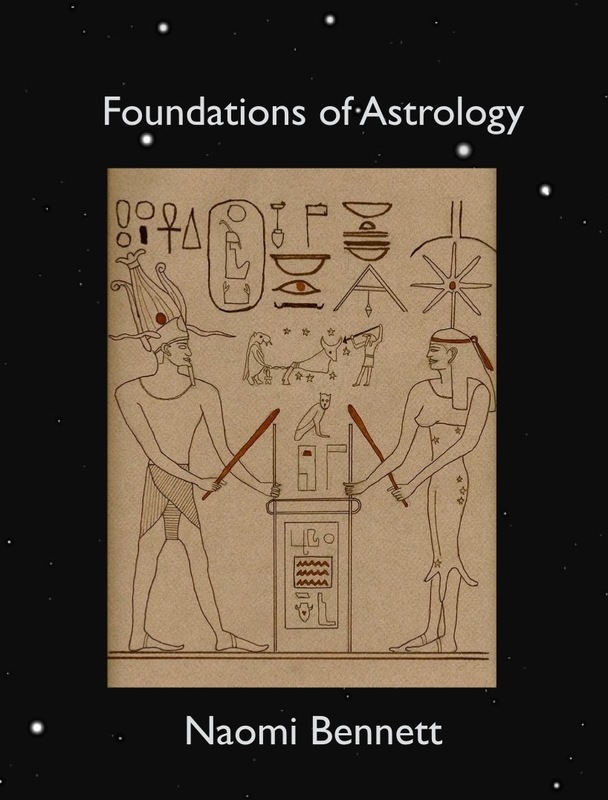 The principles of astrology expressed in this article can be found in my book, Foundations of Astrology, in print or ebook on Amazon. 2017 Predictions, astrology, Donald Trump, impeachment, resignation. Bookmark. ‘Trump’s inability to contain his tweets to the public’ that’s his ONLY fault and we don’t care. We didn’t want business as usual!